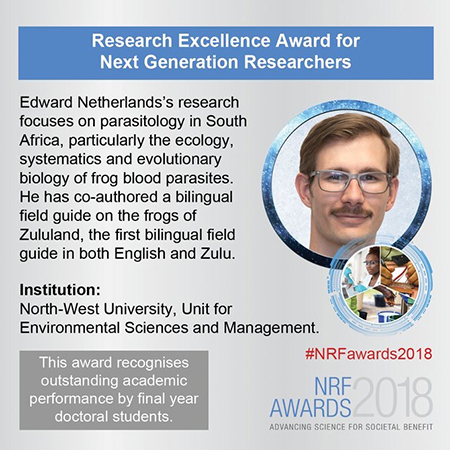 During the annual National Research Foundation (NRF) Excellence Awards, Edward was awarded with the prestigious Research Excellence Award for Next Generation Researchers. The award ceremony took place in Port Elizabeth and saw South Africa’s top researchers in attendance. As a parasitology expert from the North-West University (NWU), Edward – who is currently busy with his PhD-degree, is accustomed to academic commendation within his field of expertise. His ground-breaking work on the ecology, systematics and evolutionary biology of frog blood parasites in South Africa has seen him author several international journals. He has also presented his findings at national and international conferences and published the first-ever bilingual field guide on the frogs of Zululand. Edward is no stranger to accolades - in 2014 he received the S2A3 medal for the most outstanding master’s degree in the discipline Environmental Sciences, as well as the Junior WO Neitz Medal for the best MSc thesis in parasitology in South Africa. According to Edward, his work aims to determine the diversity, life history and the host-parasite and vector interactions of blood parasites. In addition to this, he studies the use of frog blood parasites as potential bio-indicators of ecosystem health. These different blood parasites are closely related and have similar life cycles to the parasites that cause human malaria, filariasis, and African trypanosomiasis/sleeping sickness. Although the host animals of these parasites do not display the same deadly symptoms as humans, this research will help piece together the complex puzzle of the evolution of these microscopic yet economically and ecologically important organisms. Edward is a proud alumnus of the NWU. He holds a BSc in botany and zoology from the institution as well as a honours and master’s degree. He is currently completing his PhD at the NWU’s Unit for Environmental Sciences and Management. The NRF Awards celebrate leading researchers in their respective fields based on peer evaluation and according to international best practice. The work of these researchers is assessed for, among others, their contribution to the field of study focusing on quality and impact. The awards are also aimed at inspiring and encouraging the continued culture of advancing South Africa’s knowledge economy and technological innovativeness by rewarding those that make use of research for the advancement and betterment of humanity. According to Dr Molapo Qhobela, chief executive officer of the NRF, these awards recognise and celebrate the efforts of outstanding women and men who, through their work, are advancing knowledge, transforming lives and inspiring a nation.